HOUSTON (KTRK) -- The weekend will start off cool and dry, then the rain returns to close out the weekend. Saturday will start off cool and mostly cloudy, but dry. 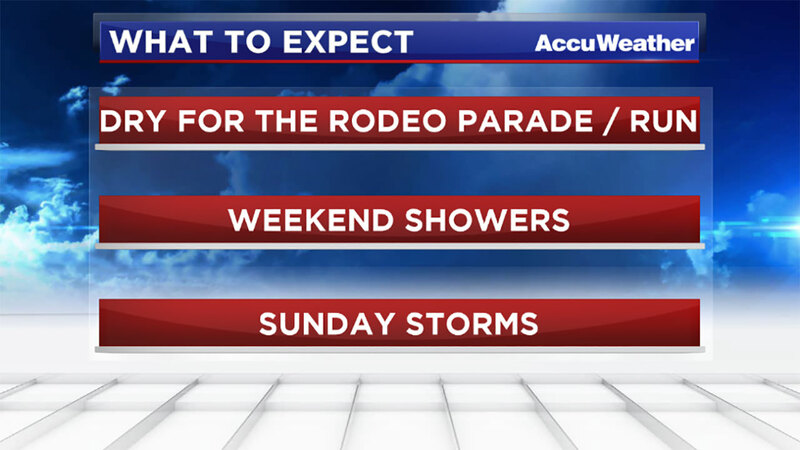 If you're headed to the Rodeo Parade or Rodeo Run, you won't need an umbrella, but you'll want a light jacket as temperatures will be in the low to mid 50s. Afternoon temperatures will hover in the 60s, as Gulf winds blow in more clouds and rain showers return by the evening. The chance for rain continues on Sunday, along with the possibility of thunderstorms. With the milder air rushing in, temperatures will be slightly warmer. You'll want to keep your umbrella close by as the unsettled weather pattern will continue for the beginning of the workweek.